Makeup is a powerful resource with the ability to emphasize or diminish your natural beauty. Beauty products should never be seen as tools to change your look but rather balance the aspects that accentuate and conceal. If applied incorrectly, you could end up doing the opposite. 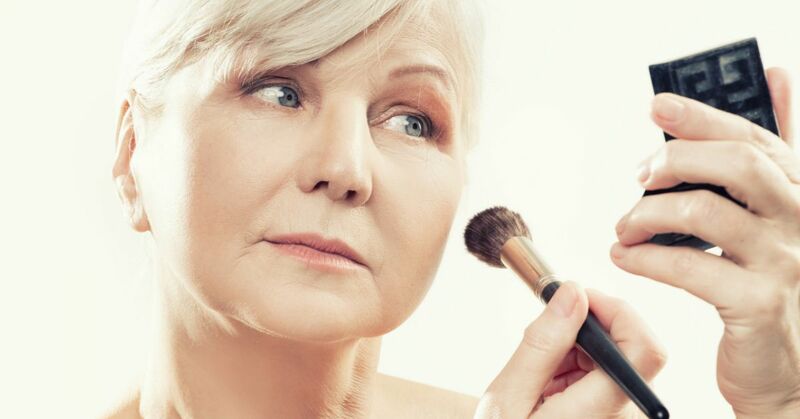 Just like clothes or hairstyles, makeup can age you beyond your years if the corrects steps aren't followed. This can be as simple as adding another product into your lineup or switching out some dated practices. The first step to a polished look is knowing your skin's specific needs and tailoring your makeup routine to fit those. Banishing these mistakes should aid in your journey to a flawless and youthful look. If your goal is to conceal signs of aging with makeup, then you need to opt for medium to full coverage foundation. Look for a formula that guarantees a lightweight feel with optimal concealment. Liquids blur skin while powder settles. You also don't want a matte finish if you're going for healthy, dewy skin. Try to apply powder only to areas prone to excess oil. Sun damage is the ultimate enemy here that speeds up the aging process. Make sure to wear products that include sunscreen with zinc oxide. Bronzers, blush and especially eyeshadows that include a shimmery finish or glitter are only going to emphasize lines. One popular myth advises you to buy foundation in a shade darker than your skin and concealer in a much lighter variety. These colors should be matched by a professional to guarantee an unbiased analysis of the hues that will work best with your skin's natural pigment and also to correct any variations. Eyeliner should be used only to emphasize the eyes, not line completely. This actually makes them look smaller and darker when you want to brighten and widen the eyes. Based on your eye shape, apply a smooth to liquid formula to prevent tugging at the appropriate place, which is usually the outer, top lash line. Depending on the length, thickness and curl of your natural lashes, choose a mascara that lifts and separates to brighten your eyes instead of adding excess drama and weight. Blush should also be matched to complement your skin, but choose a brighter shade within your options. Pinks attract light and offer a supple finish. Prepping your skin with a smoothing primer designed for anti-aging benefits can create a visible difference in your makeup application and affect its longevity. The popularity of this trend in decades past will only lend you to that era while diminishing a youthful look. Lip liner should be used to keep your lip color tight and orderly rather than standing out on its own. Sparse brows should absolutely be filled in, but with strokes that resemble actual hair and a color that is complementary and close to natural. Brows shape the face, so it's important to care for them with precision.